Posted on April 12, 2019 at 4:29 pm. Golden Technologies announces today that it launched America’s only full-time luxury travel scooter, adding a whole new class of scooters with upgraded features and design in their Buzzaround Series. The Buzzaround LX luxury travel scooter is available in 3- and 4-wheel models with standard features that include a stylish captain’s seat, an infinitely adjustable tiller with an easy to use handle at your fingertips, and a USB charging port right under the dashboard. The GB119 3-wheel and GB149 4-wheel model both have a 375 lb. 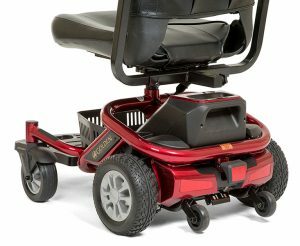 weight capacity, comfort spring full suspension for a smoother ride, and a range of up to 18 miles on two U1 batteries for all day use. The Buzzaround LX disassembles easily and offers ample foot room to enjoy being on the go in comfort and style. Red and blue color shrouds are also a standard feature. The Buzzaround LX was unveiled at Medtrade in October and was enthusiastically received by retailers for both functionality and design. At the upcoming Medtrade Convention, which will be held in Las Vegas, Nevada, at the Mandalay Bay Convention Center, Golden will feature this truly unique luxury travel scooter that allows individuals to experience maximum comfort with minimal effort while on the move. Stop by Booth #217 April 17-18, 2019, at Medtrade and be one of the first to try out this brand new revolutionary product! Posted on March 8, 2019 at 4:26 pm. Golden Technologies announces today that it launched a new power lift recliner, the Golden Siesta featuring a unique motion seat, power headrest, and power lumbar systems that are standard with a contemporary and innovative design. Standard features also include a USB charging port on a soft-feel hand control. Luxurious fabrics stocked in three colors feature designer contrast stitching to stand out in any décor. The Siesta chair was unveiled at Medtrade in October and was received with overwhelming enthusiasm for design and fabric by retailers. At the upcoming Medtrade Convention, which will be held in Las Vegas, Nevada, at the Mandalay Bay Convention Center, Golden will feature this truly unique Siesta Series chair that allows individuals to experience maximum comfort in a power lift recliner. Posted on January 25, 2019 at 4:19 pm. Golden Technologies announces today that its newest power lift recliner, the Orion, is not only the world’s first three-position lift chair featuring the unique Twilight cradle technology, it is already a retail success. “There is nothing else like our patent-pending Twilight technology and the Orion’s dual-motor system combined with this incredible seating technology allows for a deeper recline to achieve rejuvenating positions no other three-position chair on the market offers,” said Rich Golden, CEO of Golden Technologies. “Customers are looking for the best in comfort seating that provides many options at an affordable price and our retailers want to provide an innovative product that has a vast market appeal. So our expansion of the Twilight line of power lift recliners is a natural progression and fills that need for everyone,” he added. The PR405 Orion with Twilight technology was unveiled at Medtrade, the home medical equipment industry’s largest trade show, this past October in Atlanta, GA and was received with overwhelming enthusiasm. “We believe that retailers will find exactly what they are looking for in the Orion,” said C.J. Copley, Golden’s Executive Vice President of Sales & Marketing. “Adding Twilight technology to the Orion gives retailers a new dimension of comfort among three-position lift chairs,” he added. In addition to the Orion’s desirable comfort seating features, it will be stocked in five luxurious fabrics for a modern, updated look. The stocked upgrade options include two Brisa breathable fabrics that feature a new lifetime warranty. Production is ramping up this week first with Bittersweet, the most popular color ordered at Medtrade. Over the coming weeks, other fabrics will be added to the quick ship program. Consumers are able to achieve new angles for TV watching and lounge positions as well as experience a rejuvenating position to comfort the body and ease the spirit. The chairs are stylish and are hand-crafted in Old Forge, Pennsylvania, by a team of skilled craftsmen. “Golden chairs are made by Americans and we are very proud of our history and ability to provide customers with advanced seating options unlike any other manufacturer,” said Golden. Posted on November 19, 2018 at 9:47 am. Golden Technologies is happy to announce the only lifetime warranty offered for breathable fabrics on lift chairs in the industry. The extended warranty is being offered on Golden lift chair products using Brisa® by Ultrafabrics®. As proud partners in the Home Medical Equipment industry for more than a decade, Golden and Ultrafabrics have worked diligently to create an unbeatable combination of comfort and durability to deliver the most advanced lift chairs available in the world. Brisa breathable fabrics on lift chairs in the industry. We proudly stand behind the quality of our products and so does Ultrafabrics, given the technology used to create Brisa,” said Rich Golden, CEO of Golden Technologies. “This collaboration marks the fusion of true comfort seating and luxurious Brisa fabrics – both built to last. We have every confidence that consumers will enjoy their Golden power lift recliner wrapped in one of the harmonious colors in our Brisa Collection,” he added. The offer of a lifetime warranty is subject to Golden Technologies’ terms and conditions and warrants the product against original defects in materials or workmanship. The warranty will begin from the date of shipment to the Buyer and last for the life of the furniture. Golden Technologies, a family-owned and operated company, is the world’s leading manufacturer of luxurious lift and recline chairs. We take great satisfaction in the superb craftsmanship and lasting durability of our growing lines of Power Lift Chairs and Power Wheelchairs and Scooters. Golden’s products set the pace in our industry for performance, convenience, and comfort, because they all begin with superior materials and creative designs. We help provide our customers with a sense of independence, mobility, freedom, accomplishment, and belonging. With decades of craftsmanship, Ultrafabrics® is reshaping the world of animal-free fabrics – one surface at a time. Made by humans, for humans, our passion is the creation of unrivaled sensorial experiences and changing the definition and expectation for what a performance fabric can be, do and feel like. Posted on May 14, 2018 at 9:00 am. Golden Technologies was recently awarded their third consecutive, five-year contract by the Department of Veterans Affairs (VA) to supply mobility products. Golden proudly provides power scooters across the VA nationwide to enhance the quality of life for Veterans and allow them the freedom of movement and independence they so deserve. “We are humbled and honored to continue to provide top of the line power mobility equipment to our Veterans,” said Rich Golden, CEO of Golden Technologies. “The Golden Companion GC240 and GC340 power scooters allow them to access medical care and to accomplish necessary tasks in home and community environments that are so important as they gain more independence in their daily life,” he added. Golden was awarded their first nationwide scooter contract by the VA in 2003 for the categories of Mid-size 3-Wheel and Full-size 3-Wheel Scooters. The Companion GC240 and GC340 power scooters started shipping on April 20. The period of performance for the contract will end in April 2023. Posted on May 11, 2018 at 9:00 am. Golden Technologies launched a new product in their power lift recliner division, ushering in a new era in comfort seating across the home health care industry. MaxiComfort with Twilight cradle technology is a luxury power recliner capable of providing never before seen or felt levels of comfort, thanks to a patent-pending, three-motor mechanism. “We care about our customers’ comfort,” said Rich Golden, CEO of Golden Technologies, “so after years of development, we are thrilled to introduce this incredible chair. There is truly nothing else like our three-motor seating technology on the market. It didn’t exist – until now.” “Twilight cradle technology offers our customers a new range of rejuvenating positions to comfort the body and ease the spirit,” he added. Golden has been an innovation leader in this arena and the PR514 MaxiComfort with Twilight Positioning represents the next generation in their line of quality power lift and recline chair products. Consumers are able to achieve extreme Zero Gravity and discover new angles for TV watching and lounge positions. The product was unveiled at Medtrade, the home medical equipment industry’s largest trade show, this past March in Las Vegas, NV, and was received by retailers with overwhelming enthusiasm. “Truly the most significant enhancement to lift chairs since we started Mobül. The Twilight technology will further solidify Golden Technologies’ position as the world leader for years to come,” said Wayne Slavitt, Founder & CEO at Mobül: the mobility store in Long Beach, CA. Retailers are already experiencing extremely positive results by carrying the product. “The PR514 is the best chair we have by far and anyone who has seen it is has been highly impressed. Thank you for the efforts by Golden to develop products that make great margins and blow the competition away in comfort and innovation,” said Jake Theule, Retail Sales Manager at CareLinc Medical in Grand Rapids, MI. “The Twilight chair is a fantastic chair. It is now my favorite. I suspect that it will perform exceedingly high for all of us,” added Debbie Mendelsohn, President at Professional Medical Supply in El Cajon, CA. The product was released exclusively to Golden’s elite Flagship retailers this spring and will be available to all dealers in May. Posted on May 9, 2018 at 2:14 pm. Golden Technologies is pleased to announce the launch of live web chat service to assist retailers and consumers with their questions. Golden is the first in the industry to offer this enhanced level of service and chose Facebook Messenger as their platform because it is familiar to the general public and is user-friendly. Retailers can quickly find out which products are in stock and get answers to the not so frequently asked questions that may arise on the showroom floor. Golden can also assign technical issues to their in-house lift chair technicians to assist users. Creating more avenues of communication allows Golden to react quickly to service issues and gives the public more access to the manufacturer. Customers and retailers can chat live with a representative Monday- Friday 8:30 AM to 5:00 PM EST. After business hours, users may still leave a message that will be promptly answered the following business day. This initiative is part of a continued effort to enrich the Golden customer service experience, and over time, the goal is to roll out the chat platform to all of the company’s customer service, tech service, and sales departments to accommodate higher volumes of chat-related communications. Posted on December 26, 2017 at 10:05 am. Employees of Golden Technologies held a campaign to raise funds for the American Red Cross resulting in $3,000 toward the hurricane relief effort. Several Golden retailers and sales representatives were directly affected by the recent disasters. “In good times and in times of crisis, I have always been proud of the actions and generosity of our employees. Our business is helping people find freedom and comfort. Disasters like the hurricanes remind us how very fragile those privileges are and we are happy to be able to help others regain them,” said Rich Golden, CEO. “Thank you to all of our Golden Team members who contributed to the campaign,” he added. Rich Golden presented the donations to Bill Goldsworthy, executive director of Red Cross of Northeastern Pennsylvania. Employee contributions were matched by Golden. 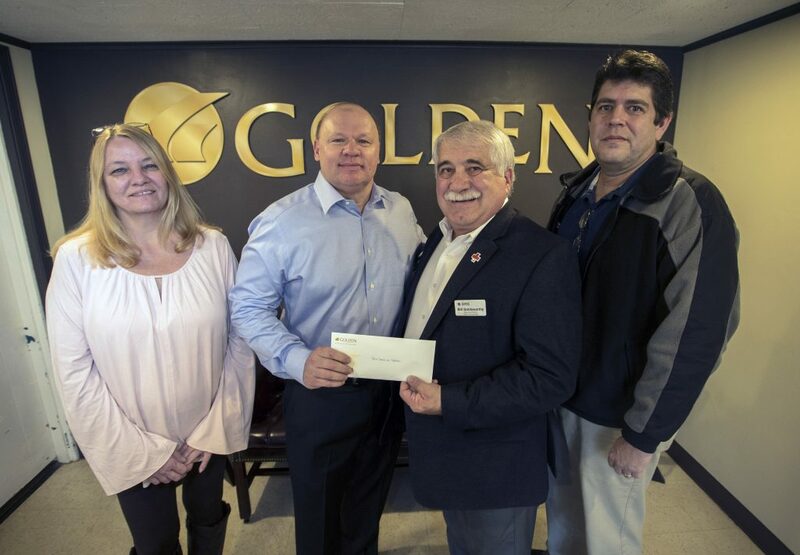 Pictured left to right: Jackie Durkin, customer service representative; Bill Goldsworthy, American Red Cross of Northeastern Pennsylvania; Rich Golden; and Joe Lyons, customer service representative. Posted on December 21, 2017 at 9:04 am. Golden Technologies has launched a new innovative product in the mobility division. The introduction of this new design and comfort features will help retailers drive cash sales with our profit producing products. The GP162 Envy is the next generation in the LiteRider series. A large, portable power wheelchair, the Envy offers a larger footplate and stylish redesign on the back with a decorative plastic color shroud. It comes in six colors: Cherry Red and Paradise Blue, along with limited edition vibrant colors including Envy Green, Solar Flare Orange, Sunburst Yellow and Satin Silver. Red models are currently shipping. Blue models and all limited edition color models will ship in early 2018. “In an effort to help retailers grow cash sales we wanted to offer more color options that are bright and inspiring for a personalized look,” said C.J. Copley, Executive Vice President of Sales & Marketing. The all-new LiteRider Envy power wheelchair is both stylish and durable with a tubular design that is unique to the Golden LiteRider family. The Envy has a larger footplate and an impressive turning radius of 28.5”, and like the other LiteRiders in the series, it disassembles quickly and easily for transport. It features 2-22 amp hour batteries for an operating range of up to 15.5 miles. The heaviest piece is only 37 lbs., making storage convenient in the trunk of any vehicle. When you are looking for a compact power wheelchair that is fun to drive and easy to transport – look no further than the Golden LiteRider Envy! Posted on November 27, 2017 at 4:20 pm. Golden Technologies has launched new innovative products in the power lift and recline chair division. The introduction of this new technology and comfort features will help retailers drive cash sales with our profit producing products. The PR404 Imperial lift recliner offers a powered articulating, full-width headrest, power lumbar, a compact 6-button remote, and a pocketed coil seat. The headrest adjusts for personalized comfort. “It’s all about comfort,” said C.J. Copley, Executive Vice President of Sales & Marketing. “It’s another product to help retailers find the perfect fit for customers.” We did a pre-launch exclusive to Flagship dealers with an overwhelming reception. “We wanted a mainstream price with a mainstream look, packed with all the options that we could make available,” added Copley. The PR713 Pub chair is a medium-sized power lift recliner with a classic look, featuring a two pillow waterfall back, nail head trim on the arms and wings, and cut back arms. It also offers a full chaise pad and pocketed coil seat for added comfort. “It’s an all-new design thanks to feedback from our retailers who wanted a more traditional look with all the modern features and comfort. A new arm design features smaller, hand tacked nails,” said Copley. In addition, we are now offering new Easy Living fabric on the PR931 Space Saver line in Anchor, Oxford, Bittersweet and Sandstorm. This fabric has a modern, updated look and tailors extremely well, bringing out the shape and design of our chairs.